At the beginning of this Valentine’s month, I decided that I needed more love in my life. By which I mean – my lack of love was painfully evident to me. It was evident in how I spoke, thought, and acted every day, particularly toward my little children. Patient and kind? So many days, I am anything but patient and kind!! By the very definition of that passage, right from the get-go, I “have not love.” This was a convicting and depressing realization, and for awhile I was bitterly disappointed in myself for not living up to expectations. Then I remembered that this is what Christ came for – to die for me, to take my sins away, and He sent His Spirit to dwell in my heart to conform me to His image! I am not a hopeless case; I’m a work in progress like every other believer throughout time. I can and will learn and grow, in His strength. I yearned to have a heart of love more like my Savior’s. 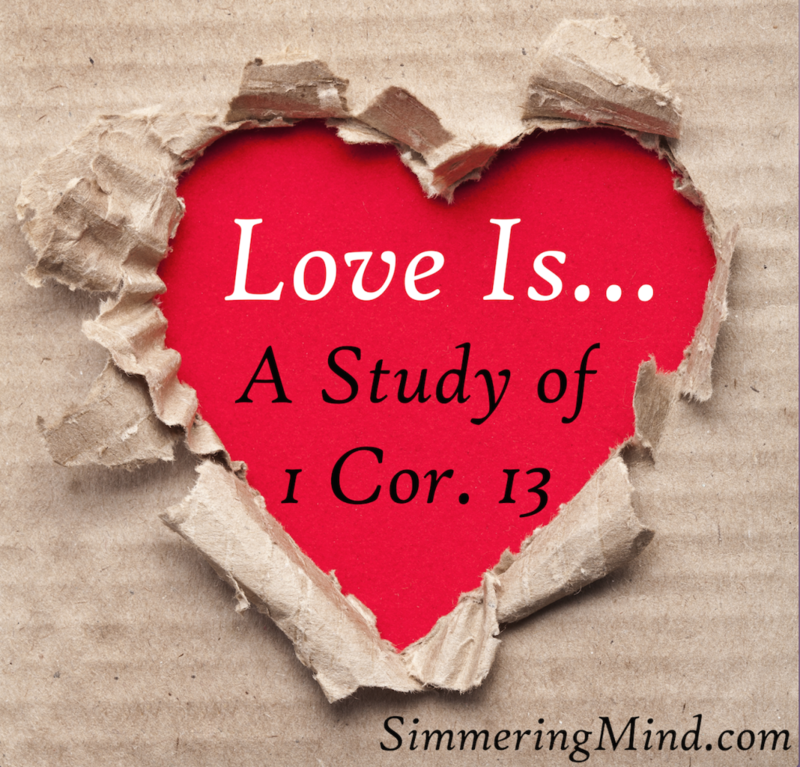 It was time to really study a well-known Scripture passage – 1 Corinthians 13. Most Christians know it. Even unbelievers who have never cracked open a Bible have probably heard part of it at weddings! It’s so familiar that it’s easy to gloss over it as we read, rather than truly digesting it and applying it to our lives. I decided to delve into it this month: to study it deeply, repeatedly, and carefully, and memorize it as best I could so that I could carry it with me always. Long story short, this has been a beautiful and mind-blowing experience. The text has opened up to me in ways it never did before, I feel like I understand it far better than I ever have, and best of all, God has used this study to reveal to me huge swaths of “weeds” in my heart…overgrowth of sin choking out love. Now that I can see the weeds, I can uproot them, and water and tend that beautiful, first fruit of the Spirit He means for His children to grow – love. Here is the entire passage. Lord willing, I hope to come back next week and discuss the first few verses to start the series. If I speak in the tongues of men and of angels, but have not love, I am a noisy gong or a clanging cymbal. And if I have prophetic powers, and understand all mysteries and all knowledge, and if I have all faith, so as to remove mountains, but have not love, I am nothing. If I give away all that I have, and if I deliver up my body to be burned, but have not love, I gain nothing. Have you ever intensively studied a Scripture passage for a specific purpose? What passage was it, and how did it affect your life?